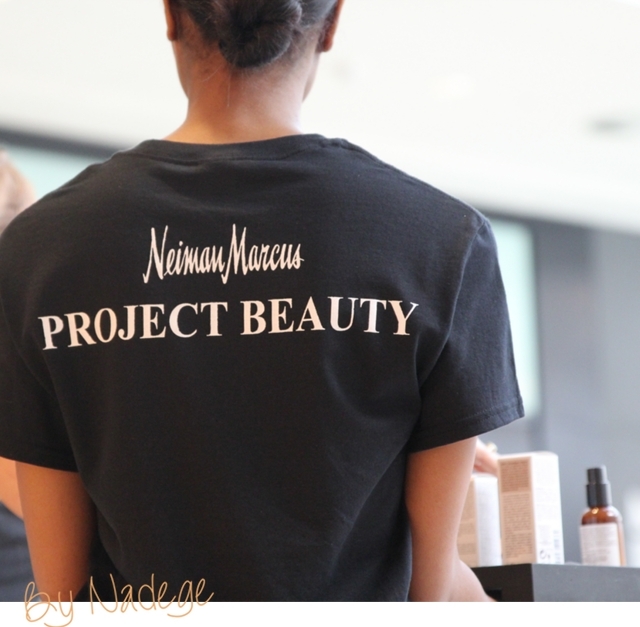 This weekend I was fortunate enough to attend the Neiman Marcus Project Beauty event. 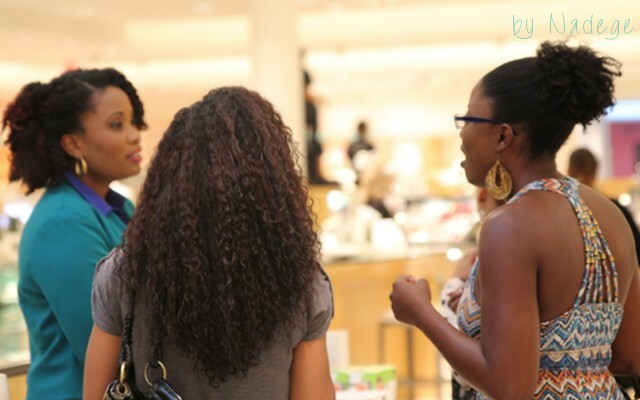 The festivities included brief presentations singing the praises of beauty brands while the attendees sipped on wine and sparkling water. The after the beauty product showcase, we were all encouraged to stop by the makeup counters for fabulous makeovers and free samples. I was much more interested in people watching than purchasing product. The commitment I made to myself (with regards to hair and beauty items) is to buy what I need, not what I want. As of right now, I don't need anything so instead of buying, I feasted my eyes on the fabulousness of others. The one thing that I did want were these perfect pair of Christian Louboutin pumps. I tried them on a few weeks earlier but I wasn't truly sold until I saw them sported by one of the Project Beauty Models. These beauties have officially made it to my currently craving list. The only brand that caught my attention during the beauty show was Kielh's. I purchased a product a while back but didn't quite remember the proper way to use it so I headed to counter to have my questions answered. While there, the helpful lady at the counter named Laura gladly answered all my questions and even provided me some free samples. But it was what she shared with me that was the highlight of my day. We chatted about my intention to seek out a higher SPF sunscreen following my conversation with Courtney. Laura tested Kiehl's SPF 50 formula on my hand. It absorbed so easily without a trace of white residue. I instantly became fond of it. Laura then mentioned that sunscreen is a daily must especially on cloudy days. Confused, I asked Laura to explain more. She shared that during their Kiel's training, they were instructed that UV-B Rays were sometimes more concentrated at higher levels when clouds were present than in clear skies. I looked into this theory further and learned that greater UV rays on cloudy days is a phenomena called cloud enhancement. Immediately my view of using sunscreen changed. Before, I would hold myself to less rigid standards when I realized that the suns rays weren't as prevalent. Now, I made the decision to use sunscreen every day, rain or shine. I also got to thinking about increased sun protection for my hair as well. You might remember my post on how UV rays break down the natural lipid layer of our hair. Because of this, I picked up some products with MEA-18 to combat the damage. I focused on using MEA-18 products during the summer months but not so much when the temperature drops. Now, I'll include products with MEA throughout the year as a means of consistent protection. I'm a big fan of Mr Marcus! Are those CLs the Biancas? BUY them! I was lucky enough to get my pair on sale and I love them. Watch out for the sizing though, I went a half size up and it makes that very high heel more manageable. @Neo- Where did you find them on sale? It looks like you had a great time at the Beauty Event. How did you get invited? I'd love to attend something like that. Also, I wear sunscreen daily and I've been doing it for the past year. My complexion has gotten so much clearer than it used to be. I highly recommend it, especially if you're combating hyperpigmentation, like myself. Have a great week, Nadege! @ Kim- The easiest ways to be invited to store events is to join their email list. Thanks for the tip on daily sunscreen. Your story inspires me to stay consistent. Hugs. Mizani Supreme Oil Conditioner Giveaway! "Brushing My Scalp Gave Me Thick Healthy Hair!" 8 Ways to stop your Shedding now! 5 Ways to keep a Summer Glow all Winter! Lila Rose Hair Jewels Review and Giveaway!